Grilling is the perfect confluence of art and science, engineering and craft, mind and spatula. The French saute, braise, and poach. They do not grill. MEN grill. This MAN-ET578BBQ instant read digital temperature gauge lets you monitor grilling conditions with an extra-long probe and a quick 5-second response time for a more accurate readout. 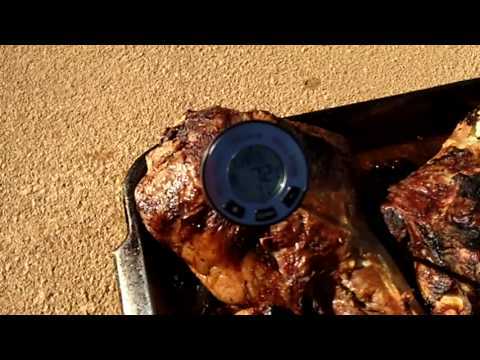 Set the alarm to the temperature of your liking and the audible alert will let you know when your meat is done. Choose from 7 preset meat types: beef, veal, lamb, pork, poultry, turkey, and burger. The digital display shows temperature readouts between 32 to 392 degrees Fahrenheit and the readout works in Celsius or Fahrenheit modes. The auto-off feature comes in handy if you forget to turn it off, and the included batteries get the grilling going quicker.